The Battle of Sidi Rezegh Seventy-Five Years On. Desert War – The Battle of Sidi Rezegh is the result of two visits made by Peter Cox and his wife Robin to the battlefield near Tobruk in Libya. 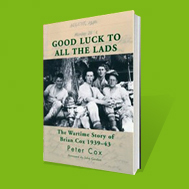 Peter’s first book, Good Luck To All The Lads – The Wartime Story of Brian Cox 1939—43, records the war history of Brian and his platoon, who fought in the Sidi Rezegh battle, part of Operation Crusader. 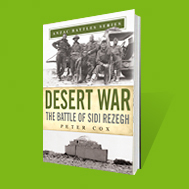 After receiving positive feedback on the book and meeting further veterans of the battle and their families, Peter and Robin undertook a second visit to the battlefield, following which Peter was motivated to write Desert War — The Battle of Sidi Rezegh, a more complete account of the battle. Peter Cox was born in Nelson and, like his father Brian, attended Nelson College. After qualifying as a chartered accountant he moved to Christchurch, where he works as a company director and business consultant. He is married to Robin, and they have two children, Rebecca and David.